Rohi's last visit was to Ngutunui Enviro School. Rohi listened to the children sing 'The Rose.' Rohi is now on her way home. Bye, Bye, Rohi. 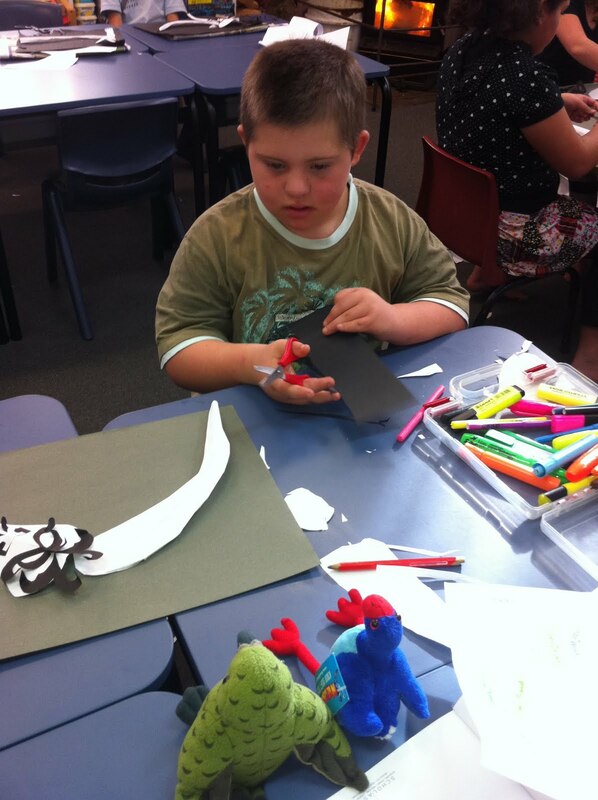 Rohi visited Kawhia School this week. 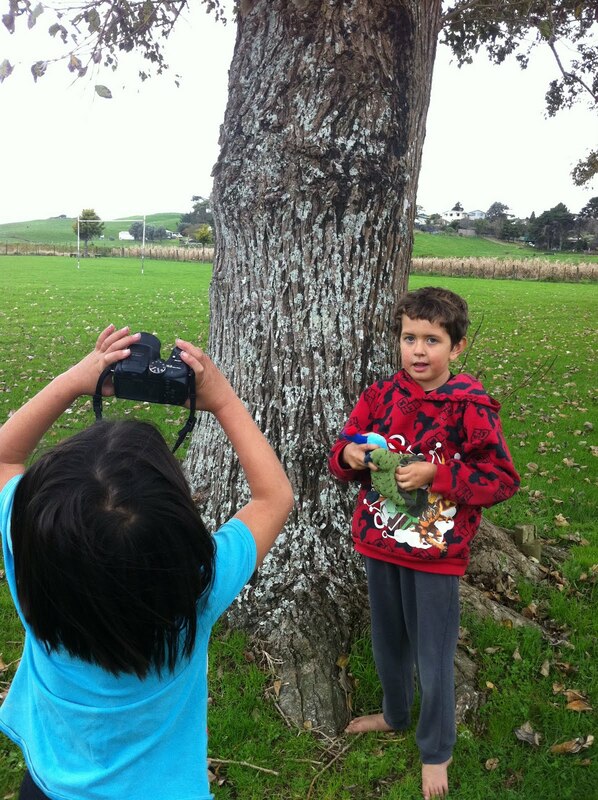 Rohi and Perky the pukeko, were helping the children to take photos. When I got home with Rohi we fed the fish in the pond and helped Mum bring in the washing. We played on the trampoline and swings and I showed him around my garden. He blended in with most of the plants. He met our dog Louie and our cat, Muffin!!! We came inside and he helped me with my guitar practice, he was a big help!! Rohi was getting hungry so we helped Mum cook tea. Me and Rohi set the table. Tea was delicious! After tea we looked down the stairway. Rohi said “it was awfully steep”. After we looked down the stairway we practiced my rhythmic gymnistics, Rohi is very good! Then we helped Mum do some baking for the school fair and the shared lunch tomorrow, yummy cheese muffins - mmmm. After baking we watched a little tv and then played on the computer. Now we are off to brush our teeth and hop into bed to read for a little while! It has been a busy afternoon! The Super Scoopers kindly sent us all these wonderful momentos of Rohi's visit to Dunedin. Today, Rohi and Perky visited Maihiihi School. We were in Room 3 and the children were using Mathletics to help them learn maths. We were on a tricky fractions problem. We are in Room 2. We are Year 1 , 2 and 3. We have been learning about New Zealand and what makes us New Zealanders. We went to visit the Otorohanga Kiwi House and we saw the keas. The keas were very clever doing tricks. They could open the cage door with their beaks. When the kea was given a full yogurt in a pot, he could open it with his beak . He wrapped his claws around the pot to stop the yogurt pot rolling away. The yogurt was a fruity yogurt and the kea ate half of it. We were very excited to receive Rohi in the post and he is going to be in our classroom for one week. Today Rohi played in our classroom, made words with the playdough during reading rotations, watched us do our work, read in our reading group, had lots of fun, took lots of fun photos and played with us. Here are some photos from our first day together. Tonight, Rohi is visiting the doctors with Connor. We look forward to hearing about his adventures there tomorrow! P.S. You can also check out our class blog for more of Rohi's adventures! Rohi has arrived in the Waikato again. She went missing for a little while but after a bit of sleuthing, I managed to track her down. When Rohi arrived at Pirongia School, my name wasn't on the parcel so Rohi managed to find a home in one of the classrooms who were delighted to see her. She met some of the locals and is looking forward to going out and about with them. I did manage to steal Rohi away for the day and take her out to Hauturu School on the Kawhia Harbour. I was so busy I forgot to take a photo of Rohi in the class but on the way back to Pirongia, I stopped and took this in the pouring rain. I hope Mrs McGhie likes it. Rohi had a great break for the school holidays. I hope you enjoy her video. She has been busy moving around the classrooms at our school and spending the day with all our students. She has four more days with us then she is going to Hamilton. This is how she spent her day with our year one students. This is how she spent her day with our year two students. There is more to come as our year 3 to six students are creating their own blog posts about her. They have photos and stories in draft at the moment. John managed to post some of his story for you.